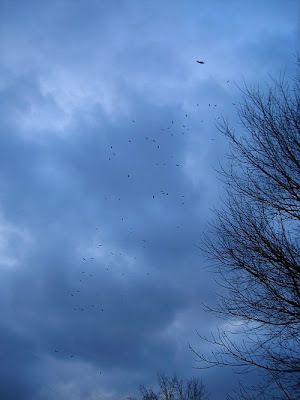 Every night, about an hour before sunset dozens of turkey vultures begin gathering in the sky above my neighborhood. They've chosen the trees behind an (un)fortunate house to roost communally for the night. We live on a limestone bluff of sorts, overlooking several corn and soybean fields placed in a flood plain. I think it must be a good place to catch one of the last updrafts of the day for a final soar while waiting for others to gather to bed-in for the night. 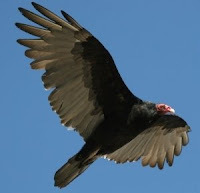 Again in the morning the fields heat up and the vultures can get an easy boost up into the air to spend another day looking for roadkill opossums and squirrels. As majestic as the soaring can seem, up close they're really ugly creatures, but I keep thinking they might make an interesting subject for a carving. Maybe by injecting some humor into it.